Last time around, we ended with the first Kingdom Hearts, because this is the kind of series in which the first game is actually the third chronological game in the story. 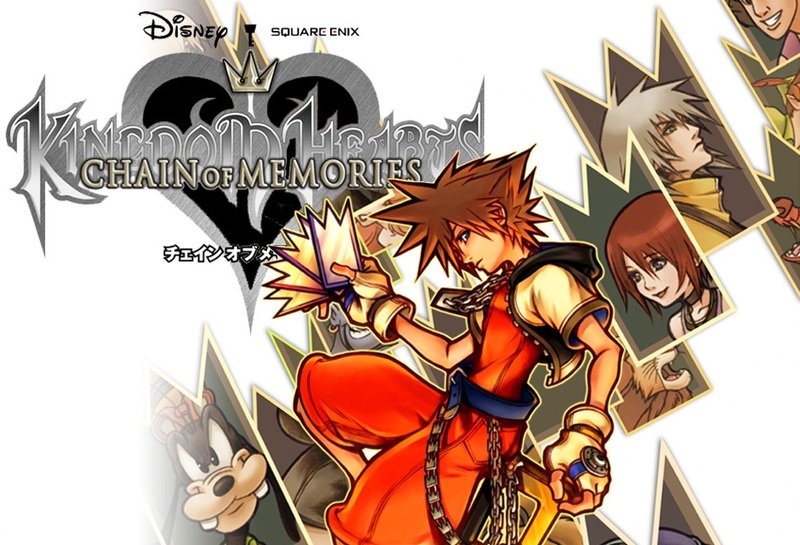 Today, we’re moving onto the next three games in the series’s timeline: Chain of Memories, 358/2 Days and Kingdom Hearts II. Instead of watching these games, which can amount to approximately 20 hours, why not read our (comparatively short) summaries for each game? After sealing Kingdom Hearts, Sora, Donald and Goofy are transported to a world where Pluto (King Mickey’s dog, of course) waits for them with an envelope signed by the king. The three follow him, but eventually lose track of him and soon run into a figure in black robes who tells Sora that ahead lies something he needs but must lose something in order to attain. Bewildered by the message, the motley trio reaches a large castle—Castle Oblivion, which, if you read the first part of this series, you know used to be the Land of Departure. Upon entering, the crew is convinced for some inexplicable reason that Mickey and their friend Riku are in the castle. The hooded figure from before steps through the entrance and lets them know that, while Sora and his friends are in the castle, they will be unable to remember every spell and ability they ever knew. Thus, Sora needs cards forged from memories to go through doors and progress deeper into the castle. That’s why you have the game’s awful card-based battle system, which might be why you skipped playing it…and which is probably why you’re here! Through each door, Sora steps into a different world he visited in Kingdom Hearts that he’s now reconstructed through his memories. He meets several members of Organization XIII, starting with the cloaked figure, who is later revealed as Marluxia, and Axel, who tells Sora that the deeper he goes into the castle, the more memories he will forget. In between these scenes, we momentarily see flashes of a girl with blonde hair, blue eyes and a white dress, often seen drawing in her sketchbook. This is Namine. Sora suddenly “remembers” that she was a friend who played with him, Riku and Kairi on Destiny Islands, but he can’t remember her name. Because Axel and Marluxia have previously told Sora that the most precious memories are buried so deep within our hearts that they’re out of reach, Sora and friends realize that going deeper into the castle will help them remember all they’ve forgotten—they have to forget to remember. Like with many things in this series, just pretend it makes sense. As they travel through the castle, Sora and pals fight some members of Organization XIII, each of who works to convince him of Namine’s existence, as well as that she is in danger and he needs to save her. At one point, he comes face to face with his good (debatable since he proceeds to attack Sora) friend Riku, who is mad Sora forgot him and Namine. But this isn’t actually Riku; it’s a replica of Riku that the lead scientist in Organization XIII, Vexen, created to challenge Sora. The members at Castle Oblivion are planning to overthrow the organization, but as you can expect, this doesn’t work out in the end despite them using Namine to create fake memories in Sora and lure him to them. Those plans are a bit boring to Axel, so he spices things up by letting Namine escape to tell Sora the truth: that she doesn’t actually exist in anyone’s heart, and that the person he’s promised to protect is Kairi. Namine has the power to enter, rearrange and create new memories, even false ones, which is what she’s been doing to Sora all along—which also means that his memories can be recovered since they’re still in him. Namine decides to help Sora gain his memories back and after Sora, Donald and Goofy defeat Marluxia, she lets him know that he has two options: he could reclaim his old memories and lose the memories of Castle Oblivion, or lose his old memories but keep his memories of Castle Oblivion. 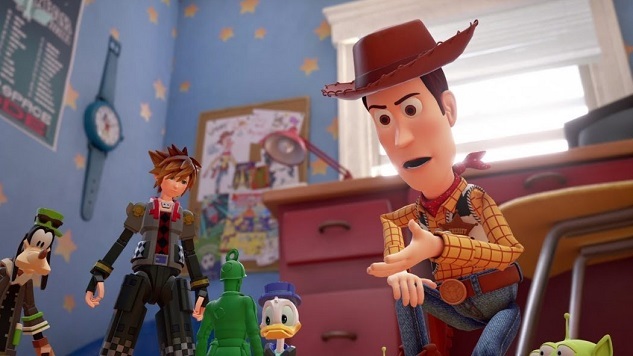 Sora naturally chooses to get his old memories back, and Namine puts Sora, Donald and Goofy in pods where they must sleep until she rearranges their memories back together. In order to remember her, Jiminy writes in his journal to ‘thank Namine’ someday. But we’re not done yet, because it’s Kingdom Hearts, so of course nothing’s simple. As all this was happening, Riku (the real one) is transported from the realm of darkness at the end of Kingdom Hearts to Castle Oblivion’s deepest basement. He fights his way up and tries to overcome the darkness in him. He battles several Organization XIII members—Vexen, Lexaeus and Zexion—and eventually comes upon a man named DiZ. He also meets Namine and his own replica, which sets out to kill him after it learned of its false memories and existence. Riku destroys the replica and proceeds to face Ansem, the seeker of Darkness, who has been possessing his body because of the darkness that still resides in Riku’s heart. Riku’s replica, who has since learned of his altered memories, seeks to justify his existence by killing Riku, only to be destroyed by him. Riku chooses to face Ansem upon learning from Naminé that Ansem lives in his heart, and defeats him after DiZ summons him for Riku to fight. After getting an Organization XIII cloak from DiZ (because it protects him from being sensed by them and being devoured by the darkness), Riku sets out on a journey to utilize both his darkness and his light with Mickey as his companion, uncertain as to where it may lead but firm in his decision to walk the road to dawn. This one is a little more accessible than most of the other games since it’s been ported to Kingdom Hearts HD 1.5 Remix as a three hour-long movie. But three hours is a lot, we get it! We’re here to help if you want to skip that, too. Like Birth by Sleep, 358/2 Days focuses on a different trio from Sora, Riku and Kairi. Days centers on a trio of friends in Organization XIII: Roxas, Axel and Xion—who is the Organization’s 14th member. Roxas is Sora’s Nobody. To offer a refresher: back in Kingdom Hearts, Sora momentarily turned into a Heartless in Hollow Bastion. When this happens, a Nobody is also born, and Organization XIII is a group of special Nobodies with human forms and special powers. All of them save for Roxas and Xion hold the memories of their past human selves. Roxas and Xion join the Organization around the same time and quickly become best friends with Axel. 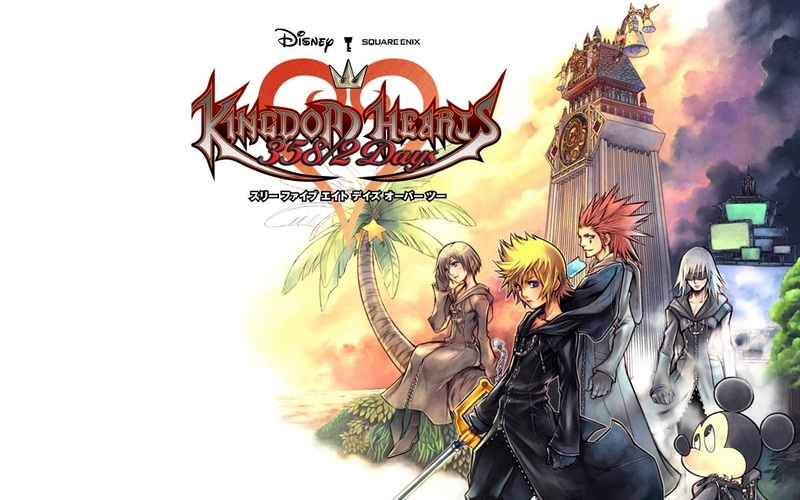 Axel is sometimes absent because 358/2 Days takes place at the same time as Chain of Memories, so he’s traveling between Castle Oblivion and The World That Never Was, where the Organization’s headquarters are. During this time is when Roxas and Xion become close. Both of them can wield Keyblades, which is essential to the Organization’s goal of collecting released hearts to complete Kingdom Hearts. Once they do that, they can assimilate with Kingdom Hearts and become whole, gain a heart and finally feel like complete selves. Over the course of 358 days, Roxas carries out missions with different members of the organization. Xion confides in Axel that she has fragments of memories—not full memories, but isolated moments that she vaguely remembers. Roxas has no memories of the past, but he feels like the memories he has made with Axel and Xion are the most important things to him and are the only thing he wouldn’t want to lose. For Nobodies, for beings with no hearts, the Organization members seem to feel a lot, yeah? One day, Roxas feels Xion drifting from them. She’s distracted during a mission she has with Roxas, which usually doesn’t happen, and she misses a few of their gatherings at the clock tower in Twilight Town. Xion’s entered a depression after a recent encounter she had with Riku, in which he calls her and her Keyblade a sham and tells her to leave the Organization. Combined with Saix calling her a mistake, Xion starts doing things on her own, and even begins to fall into random deep slumbers and dizzy spells in which she has dreams of Sora’s memories. In order to find out her true origins, she runs away from the Organization. It’s during this that she later meets Riku again. Riku has sought her out because he had recently visited Namine in Twilight Town, who has been busy trying to piece Sora’s memories back together since the end of Chain of Memories. She revealed to him that Xion is absorbing Sora’s memories and delaying Sora’s awakening. Roxas and Xion have been forming their own identities and are fighting so much to become their own people that they are preventing Sora to awaken. She tells Riku that while Xion’s face used to be blank, she now has a clearly visible face—a face that, from the beginning, is clearly similar to Kairi. This is because Kairi is Sora’s most important person; thus, his memories of her are the strongest he has, and those memories have taken shape as Xion. Riku shares this information with Xion, who now struggles to decide where she belongs and what is best for everyone else. Axel and Roxas use their spare time to find Xion. They eventually find her and despite Roxas’s pleading, she tells him she won’t return to the Organization. Xion proceeds to fight Axel, who knocks her out and takes her back to the Organization. Back at their headquarters, Xemnas reveals to Roxas that Sora is the connection between him and Xion as well as why she’s in the Organization. By keeping the two close to each other, Xemnas is able to prevent Sora from waking up and stopping his plans. When Xion returns to the Organization, Roxas grows weaker by the day, especially when he uses his Keyblade. This is because Xion is actually a replica; she’s Replica No. 1 (throw the X in there, move letters around and you get her name), a part of Vexen’s Replica Program, which also involved the Riku Replica in Chain of Memories. Her powers get stronger as Roxas’s become weaker—something Axel is now aware of. Namine tells DiZ that Sora’s memories have stopped, and a hand must be forced. This is something Xion knows, as well. She runs away again, and even though Axel is sent to bring her back, he lets her escape after they fight. This angers Roxas, who hears the truth about everything from Axel when he comes back from the fight. Fed up with the lies of the Organization, Axel refusing to explain who he really is, and all that is happening with Xion, Roxas deserts the Organization to get answers. Xion seeks out Namine, who warns her that if she returns to Sora, Xion will disappear and nobody will remember her. Xion makes her decision, allows Axel to bring her back to the Organization and faces Roxas, who now sees her face as Sora’s because her time is almost up. The two fight and Roxas eventually defeats her. Xion disappears in Roxas’s arms as he starts to forget her; it’s a scene worth watching, for it’s surely one of the most tragic moments in the series. Before she completely disappears, Xion asks Roxas to stop Xemnas from getting Kingdom Hearts, and she thanks him and Axel for their friendship, which will last forever. Roxas has set himself on freeing Kingdom Hearts and finding Sora to eliminate him so that he can have his own life and friends back. As Roxas is leaving the Organization’s headquarters, Riku ambushes him and the two fight. He almost defeats Riku, but Riku gives into the darkness (which makes him stronger) to fulfill Xion’s wish and stop Roxas. Riku takes a defeated and collapsed Roxas to DiZ, who has formed a plan to get Roxas to return to Sora. Roxas wakes up, seemingly having a normal life in Twilight Town, marking the beginning of Kingdom Hearts II. This game is A LOT. Thought the last few entries having cutscene movies five hours long was bad? The cutscene movie of this game on YouTube is 13 hours. Whew. Sora’s friends may be his power, but our dedication to summarizing this incredibly complicated series for you is ours. Let’s get to it. This game picks up from the end of 358/2 Days. Roxas wakes up in Twilight Town, having become close friends with three teens known as Hayner, Pence and Olette. Over the course of his “last week of summer vacation,” Roxas is flooded with Sora’s memories, even connecting to Kairi at one point and briefly communicating with her when he tries to call out to Namine for help. This happens because Namine is Kairi’s Nobody. As one of the seven Princesses of Heart, Kairi’s heart lacks darkness. Thus, her body and soul never left the Realm of Light, which is why she was in a comatose state in Kingdom Hearts. Since a heartless wasn’t created when Kairi lost her heart, Namine was born from Kairi’s heart but from Sora’s body and soul, created when he pierced his own heart and became a Heartless in order to set Kairi’s heart free. This is why she was able to manipulate Sora’s memories and those of people connected to him. Through his conversations with Namine, Roxas learns more about Sora and DiZ, who has been constantly in the background. After many events, including Axel trying to get him to come back to the Organization, Roxas realizes that he isn’t actually in Twilight Town. This has just been a virtual simulation of Twilight Town, created by DiZ to get Roxas to merge with Sora so that Sora can finally wake up. With Roxas realizing what he has to do, he merges back with Sora, and it’s incredibly tragic when you reflect on how Roxas has now twice formed connections he deeply cares about only to realize he isn’t an actual fully-realized person. Sora, Donald and Goofy soon wake up after that. When they run into King Mickey in Twilight Town, he sends them to Yen Sid, who tells them of the threat that are the Nobodies and Organization XIII. 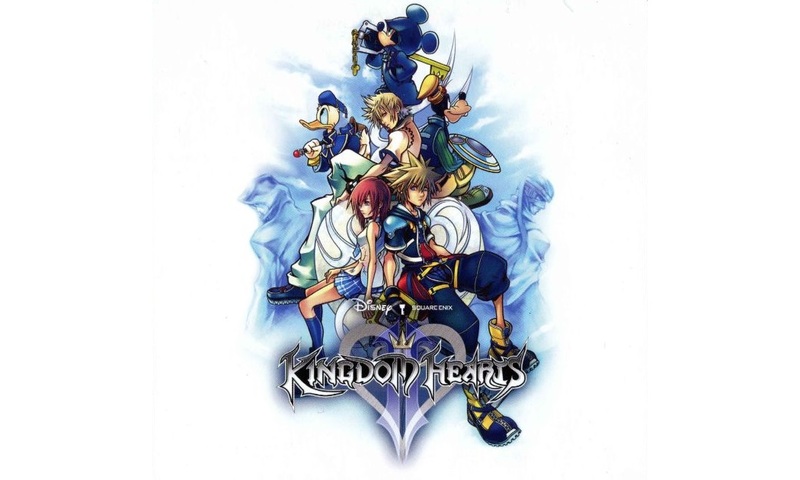 The three friends embark on a journey to find Riku and to stop the Organization. After that, you see Maleficent reappear…even though she died in Kingdom Hearts. There is a valid but extremely convoluted explanation for this that we will get into in the last part of this lore summary. Just accept it for what it is for now. She tends to pop up and is relatively ineffective at making the group’s lives difficult in comparison to the Organization. Sora, Donald and Goofy travel through various Disney Worlds and seal the doors to protect the worlds from the Heartless and Nobodies. One day, Kairi decides to look for Sora and Riku instead of waiting for them at Destiny Islands. Axel tries to kidnap her and chases her through a portal (that Riku opened up after sensing she was in danger) that takes her to Twilight Town. While he does capture her there as she waits for Sora, she’s eventually captured by Saix and taken to the Organization’s headquarters. After searching for Kairi to no avail, the gang goes back to Hollow Bastion, where they learn of Ansem’s study and computer room. King Mickey finds them and explains that who Sora and friends thought was “Ansem” (the dude they defeated at the end of Kingdom Hearts) wasn’t actually Ansem. That was just his Heartless who went around telling people he was Ansem. The real Ansem is around somewhere—and he’s not even named Ansem; he’s Xehanort. Xemnas, the leader of Organization XIII, is Xehanort’s Nobody. They leave Ansem’s study and go out to fight an ongoing Heartless/Nobody war in Hollow Bastion. They defeat Demyx, the first in a string of Organization members they will end up fighting. After briefly coming face to face with Xemnas, Axel and Saix, Sora and friends leave Hollow Bastion to do more Disney World shenanigans. In the process, they meet Xaldin (whom they defeat) and Xigbar (whom they don’t defeat just yet). They eventually head back to Hollow Bastion and learn that Ansem’s computer room has a program that cranks out endless Heartless, which is why it seems like the Heartless never lessen in numbers. The Hollow Bastion Restoration Committee (which consists of various Final Fantasy characters) puts together a disk that eradicates the program, ending the threat of the Heartless in Hollow Bastion. After the many years since Xehanort assumed control, Hollow Bastion finally goes back to being Radiant Garden. Sora and friends go back to Twilight Town, where they save Pence, Hayden and Olette from some Nobodies. King Mickey tells them that he’s figured out that Ansem the Wise has infiltrated Organization XIII’s stronghold. They head into Namine’s mansion, find Ansem’s computer room, and through there go into the Realm of Darkness. At the Organization’s stronghold, Namine and Riku help Kairi escape from Saix’s hold so that they can reunite with Sora. As Kairi is being attacked by Heartless while trying to reach Sora, Riku gives her a Keyblade, and the two fend off an army of Heartless that Saix summons to stop them. Elsewhere, Mickey finds DiZ, who was actually Ansem the Wise this entire time. You see, to stop the darkness from swallowing Radiant Garden, Ansem the Wise sought to research and understand it. He did this with the help of six apprentices—Braig, Dilan, Even, Aeleus, Ienzo and Xehanort. He used Xehanort to study the darkness in his heart, hoping that this would also help him recover his memories. Unfortunately, his apprentices used his laboratory to conduct inhumane experiments on the human heart and its darkness. Ansem felt betrayed by his apprentices, so he put a stop to the experiments. Around this time, King Mickey found his way to Ansem the Wise, and their friendship helped him heal; this is how the two know each other. Despite this, the six apprentices kept dabbling into the darkness behind Ansem’s back, and upon being consumed by it, they produced the first members of Organization XIII (Braig = Xigbar; Dilan = Xaldin; Even = Vexen; Aeleus = Lexaeus; Ienzo = Zexion). The apprentices then sent Ansem the Wise to the Realm of Darkness, where he discarded his name (which Xehanort had stolen through writing false “Ansem Reports” in order to present himself as Ansem) and assumed the identity of DiZ. After a while, he escaped when he gained the power of darkness. He used corridors of darkness to arrive at Twilight Town, where he observed everything and continued to study the Heartless and Nobodies. After this, Sora defeats Xigbar and has an emotional reunion with Kairi and Riku. The group also defeats Lexaeus and Saix on the way to reuniting with King Mickey and Ansem, during which Riku reveals to Sora that Roxas is his Nobody. In the meantime, Ansem carries a special device up to one of the highest points of the building with King Mickey. This device would reclaim Kingdom Hearts and encode it as data. Ansem the Wise is, ultimately, the reason for the existence of the Heartless. As the device explodes and seemingly kills him, bringing about a surge of light, he is able to achieve redemption for his mistakes. The explosion also rids Riku of the presence of Ansem, Seeker of Darkness and undoes what the Organization has done with Kingdom Hearts. However, this summons an army of Heartless in the city below. Maleficent and Pete had been around, so they show up to put a stop to them. Sora and Riku go to stop Xemnas, which proves to be a long fight consisting of many stages in typical JRPG fashion. In between them, Namine opens a portal for everyone to go through in order to return home, and as she does, she recognizes Roxas inside of Sora. The two reunite and have a conversation before returning to their original selves. After everyone but Sora and Riku has stepped through the portal, Xemnas closes it, cutting the two off from the rest in hopes of killing them. Sora and Riku win the long battle and defeat Xemnas together. They follow a light that appears after Xemnas is defeated and end up in the Realm of Darkness, at the shore where Ansem and Aqua will soon meet. The two have an emotional conversation, and after a bottle with a note from Kairi (which she had sent at the beginning of the game while she was still trying to remember Sora because Namine was still re-arranging his memories) washes up on the shore, they step through a door that opens and leads them back to Destiny Islands. Everyone reunites and it’s a happy ending. ...Except not quite. As Sora and Riku are chillin’ on the beach, Kairi brings a letter in a bottle to them. Sora notices the letter has been signed by King Mickey, and this letter is the bridge between Kingdom Hearts II and Kingdom Hearts III. In the next and final part of our lore primer, we’ll be recapping Re: Coded, Dream Drop Distance and other tidbits of information from the mobile game Union X.